This is the second installment of my Eli Roth Triple Feature Review. In this post, I will discuss the movie Eli Roth Presents: The Stranger. So, I know this movie wasn’t written or directed by Eli Roth, but his name is in the title, so I decided to include it. 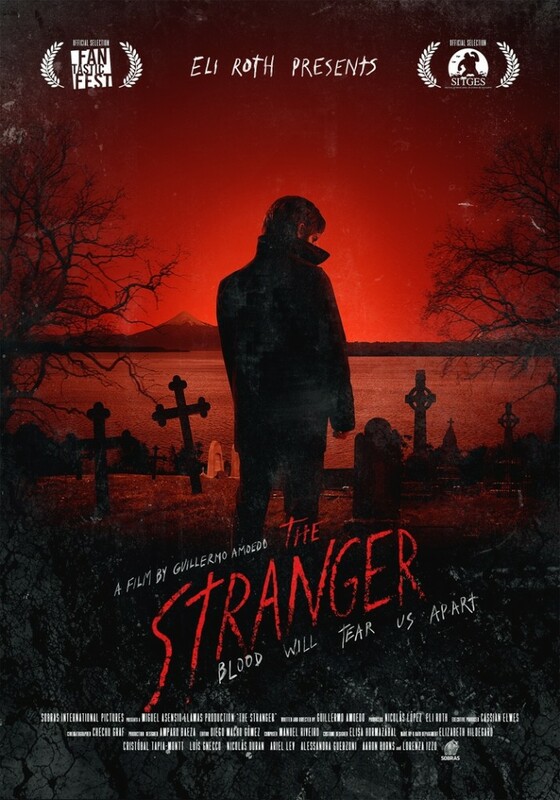 Not only that, but three of Roth’s go-to actors are cast in The Stranger, including his wife Lorenza Izzo (The Green Inferno, Knock Knock), Ariel Levy (The Green Inferno) and Aaron Burns (The Green Inferno, Knock Knock). Before I begin, though, I would just like to say that I want to give Aaron Burns a hug. If you watch all three movies, you’ll understand why. The Stranger follows a “sick” man named Martin (Montt), who shows up at the small town home of teenaged Peter (Duran), looking for his wife Ana (Izzo). Peter informs this stranger that Ana is dead, shows him to her grave and leaves. Mourning her death, Martin is jumped by a group of men led by Caleb (Levy), who leave him for dead. When Peter finds him and takes him home, bloody and fatal events start to happen. It’s a vampire movie, but they don’t once say the word vampire. They continue to refer to it as a “sickness,” but the fact is that Martin’s blood has healing powers, he can regenerate by drinking the blood of other living beings and he burns in direct sunlight – that spells VAMPIRE. I don’t like when vampire movies try to hide the fact that they’re vampire movies. I understand that Twilight ruined it for everyone, but that doesn’t mean you have to run away from it. There were a lot of elements to this movie that were not believable. For example, how everyone always knew where to find everyone else is a puzzle to me. Peter knows where to find Martin when he’s left for dead. Caleb knows where to find Peter after Martin’s body disappeared from the dump site. Caleb’s dad knows where to find Peter and his mom when they flee. It’s just not believable. Also, it seems that everyone has forgotten the fact that police vehicles have GPS built into them. In real life, fleeing a cop car or stealing a fire police car is not a very smart thing to do. The acting was just okay. Lorenza Izza wasn’t in it enough, if you ask me. Cristobal Tapia Montt and Nicolas Duran were amazing. They played off of each other very well. You could really see a good dynamic there. Ariel Levy was awful, just like in The Green Inferno. He’s not connected to his character enough, which causes his performance to fall short. I had the same problem with Alessandra Guerzoni, who played Peter’s mother, and Luis Gnecco, who played Caleb’s cop father. Nobody was believable. I’m going to say no. Don’t waste your time. The movie is entertaining, but it lacks any real substance. It would have that substance if the supporting cast were different, but it is what it is. This entry was posted on October 15, 2015 at 8:00 pm and is filed under Review with tags creepy, Eli Roth, Horror, Horror Movie, the stranger, Vampire. You can follow any responses to this entry through the RSS 2.0 feed. You can leave a response, or trackback from your own site.